WTI prices have just cracked through another price barrier: the $55/b mark. Prices strengthened over the New Year’s holiday, and they surged again this morning in early trading. 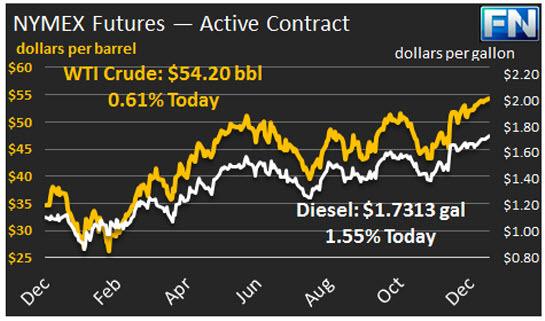 WTI opened at $54.20/b today, an increase of $0.33, or 0.6%, from Friday’s opening price. WTI prices have not opened above $54/b since July 2015. Prices are currently $55.01/b, a hefty $0.81 above the market opening value. It is likely that today’s session will be busy, with considerable price variability, and the market will watch to see whether WTI can maintain a $55/b price at closing. This has not happened since the first week of July in 2015—eighteen months ago. Today is the first formal trading session of the New Year, and the OPEC-11 and NOPEC-11 production cut pact is officially on. Oman and Kuwait appear to be the first to make announcements. Oman last week informed some customers that supplies would be reduced, with the target being a cut of 45,000 bpd. Kuwait reported yesterday in local media that it was cutting output by 130,000 bpd. Distillate opened at $1.7313/gallon in today’s session. This was 2.65 cents above Friday’s opening price. Current prices have jumped to $1.7561/gallon, another 2.48 cents per gallon higher. Prices are looking stable in early trading. RBOB prices were strong last week, but they declined modestly in the last two sessions. RBOB opened at $1.674/gallon, down 0.23 cents, or 0.14%, from Friday’s opening. Prices now have risen to $1.6984/gallon, 2.44 cents higher than the opening price. At the retail level, the 4th Quarter of 2016 brought a steady strengthening of gasoline and diesel prices. This brought the annual average up above last year’s average prices. U.S. diesel prices averaged $2.54/gallon at the end of 2016, 30.5 cents higher than the average prices at the end of 2015. Gasoline prices averaged $2.31/gallon at the end of 2016, 27.5 cents higher than the average prices at the end of 2015. 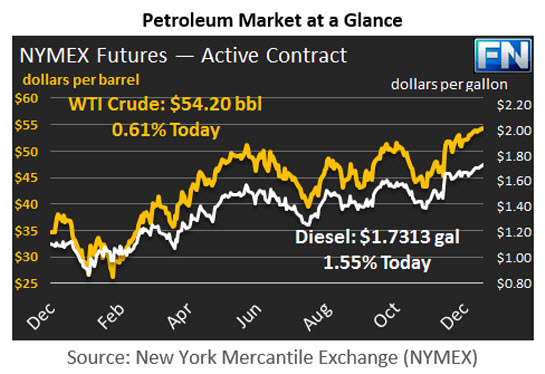 Our second article today provides a Year-in-Review of gasoline and diesel retail prices. Next ArticleThe Long Decline in Convenience/Motor Fuel Site Count is at an End.